Wednesday h'Alfred 'as 'is dinner h'early,"
Happily, thanks to the excellence and efficiency of our cook/housekeeper, Tímea, our lives are not quite so curtailed with domestic chores. Indeed, looking back over the previous two weeks we can, in fact, only count on one night 'in', so to speak, the rest having been enjoyed 'out' with a variety of concerts, a Private View, wonderfully delicious dinners in numerous Budapest restaurants, matched only by those served in the homes of friends, contemporary dance, the cinema, not to mention a surprise joint birthday party given for us by The Bright Young Things as well as Anniversary celebrations. And such fun we have had. Highlights must include in the way of music the most amazing 'Habilitácios Hangversenye' where our extraordinarily gifted and talented friend, Nemes László [Director of the Kodály Institute of Music], conducted a choir to include works by Mendelssohn and Schónberg and which can only be described as outstanding. On another night we attended a concert performance with the Purcell Choir of Rameau's 'Les Fétes de Polymnie', superb in every respect, whilst most recently, our Polish friend, Magdalena Wajdzik, played the work of the young composer, Baqais Ádám, in a most interesting competition concert. To this must be added a somewhat lack lustre, at least for us, evening with Rufus Wainwright made up for by an exciting evening of modern dance where, in each piece, we could count our friends amongst the dancers. A trip to the cinema, 'A Grand Hotel Budapest', left us with divided opinions but not so dinner out with friends where we were treated to an Italian restaurant, 'Via Luna', to 'Spinoza', a firm favourite, and to 'M' where we enjoyed a hilarious evening with close friends one of whom is, in all truth, a Princess from China! Next day in the Four Seasons Hotel, for reasons unknown, she so generously showered us with gifts and presented us with the most enormous teddy bear!! 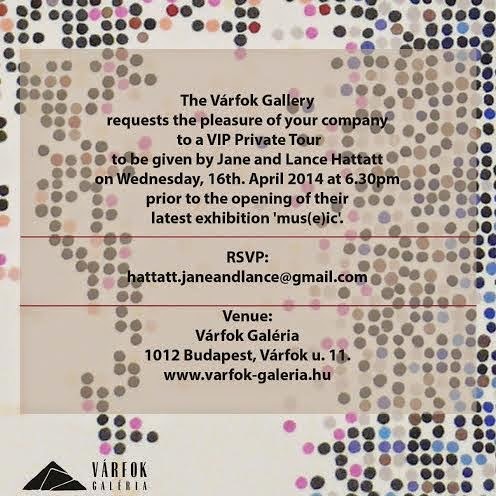 Now, at the invitation of The Várfok Gallery, Budapest's longest established private art gallery, we are looking ahead to Wednesday when we shall lead a VIP Tour of the latest exhibition showing the work of two leading Hungarian contemporary artists, Jovánovics Tamás and Keseru Károly. Our work is cut out!! But it beats Washing Day!! happy happy birthday, what lovely flowers you have received, I couldn't keep up with your schedule out of the home, I admire your schedule, I'd need a day to recovered between each one. too much stimuli to take in all at once. Thank you so much for the birthday wishes, Linda. And we are still enjoying the wonderful flowers. Believe us, sometimes the schedule is a little punishing, particularly on those nights when we are in bed late and up early!! We are so pleased that you have enjoyed it. We really do recommend a visit to Budapest. The cultural life, particularly where music is concerned is, in our view, second to none. Budapest life has you in its grip. You are both truly enjoying such wonderful evenings out , theatre, restaurants with good friends. What more could one ask for. I wish you luck leading the Gallery tour. How exciting indeed. Enjoyed thoroughly reading this super post on your life in Budapest. We are, Val, so very fortunate to have so much happening in our lives and so often with really good, close friends. We are much looking forward to the Gallery tour; this afternoon we met one of the artists - fascinating. Thank you so much for taking the time and trouble to comment. It is much appreciated. While some people take it easier when their get older, the two of you seem to get busier and look younger by the day :-)!!! You will have to tell me your secret when I next see you!! Is it all those incredibly interesting and artistic people you meet, while walking your path of life?! Have fun this week and before I leave: dear Jane, congratulations on your birthday and happy anniversary to the two of you as well!!!! So very sorry I forgot about it. I saw the date passing by on Facebook, but it simply popped out of my head! It is so good to have many different things happening, Madelief, and we think of ourselves as fortunate to live in Budapest where there is so much on offer. We had mixed feelings about 'A Grand Hotel Budapest' and it will be both interesting and fun to discuss the film with you. Our expectations of Rufus Wainwright were high and we both, as well as the friends with whom we went, felt a little let down. Yes, his step sister also played a leading part in the concert. We forget her name. But more to talk about in May! My goodness, I feel exhausted just reading about your social (but very obviously) fun pursuits. How wonderful to have the energy to get though it all with aplomb. Congratulations on birthdays and anniversaries celebrated. The flowers, I am sure, were just the icing on the cake! It is, as you say here, all great fun. We should certainly not do it if it were not so although, at times, it does require much in the way of energy. Thank you so much for the good wishes. We love receiving flowers so these were especially a welcome gift. What a joyous week! Wishing you a very Happy Birthday and Anniversary.. Thank you so much, Adrienne. We have had, and are continuing to have, the most wonderful of times. Jane and Lance, it is so wonderful to read of your posts and pursuits in this marvellous city which has so much to offer. Oh, and such exquisite flowers for such special celebrations. Budapest really is the most extraordinary city, Rose, with so much happening. When we arrived here fourteen years ago, we never dreamt that life would be so enjoyable. And yes, the flowers are simply wonderful [and that was the second arrangement from Carlo and Andrea]. A sumptuous feast of fun! I love the display of programs. Enough music going on even for your wide and catholic taste, Susan. All the more reason to visit! Belated Happy Birthday to both of you. Thank goodness you have Timea or else I don't think you could stand the pace of your social life this week . Do you need a p.a.? I'd volunteer for free if you'd take me along to half of the events. Thank you so much for the birthday wishes. If we had no Tímea, then we suspect that our lives would fall apart or else we should be reduced to living in one of those depressing boarding houses which cater for retired 'gentle' folk!!! The kind which might exist in a novel by Elizabeth Taylor [a writer, incidentally, who we greatly admire]. A belated Happy Birthday and Anniversary! There does look to be much fun to be had in Budapest. I've visited just once, a short business trip which left little time for anything other than a brief evening wander down the Danube. Good luck with the exhibition and what on earth are you going to do with that bear? It is to be hoped that you will have a future opportunity to visit Budapest for there is here so much which is worth exploring, much of it hidden. Now the bear is something of a problem!! At present sitting in an armchair in the spare bedroom! Hello Jane and Lance, I should that that you would be glad to get back to some nice, relaxing floor-scrubbing after all those activities. I am envious of the people who will get to get to hear you introduce the work of artists Jovánovics Tamás and Keseru Károly. I just looked up some of their works, and am impressed with their use and control of color and texture. I am sure that it will be a memorable show. You are right, Jim. Give us a mop and bucket and a pair of 'Marigolds' and we are as happy as the proverbial Larry [who, by the way, was he?]. We are especially delighted that you should look up the two artists whose work we shall tour on Wednesday. Their control, in all aspects of their paintings, is quite amazing. This afternoon we had the pleasure of meeting with Keseru Károly, delightful as you may imagine, and we have also been in touch with Jovánovics Tamás who we shall meet later in the week. Life is so interesting. Certainly the exhibition, to be hung today and tomorrow, promises to be fascinating. Happy Birthday to Jane and congratulations on your anniversary. We had a piano recital last Saturday afternoon, but I had to give four guests lunch before we could leave, sadly no Timea lurking in the background for me. It is good to keep busy and make the most of everyday that comes, but sometimes I look at my diary and just long for a blank page. May one ask how many mad boys are there now? The Italian ones sent the most exquisite flowers to Jane. Rosemary, thank you so much for your congratulations. It is most kind of you. How lovely to have gone to a piano recital last Saturday. We wonder what was played but are sure that whatever the programme you will have enjoyed it immensely. Sometimes, as you say, one could do with a little less happening but it is good to live the life extraordinary!! We do seem rather to collect 'Mad Boys'. Carlo and Andrea, the Italian ones, are very close to us and are extremely kind and generous. We shall visit them in Pisa at the start of June. Our recital was given by Angela Hewitt, a wonderful Canadian Pianist to a music society we belong to. This all sounds to be as near to perfect as it becomes. A simply lovely programme and thank you for taking the trouble to have replied. We should be hard pressed to choose a favourite piece. It sure does beat washing day.You sounds like you're having all sorts of fun. The flowers are gorgeous and that bear seems to have quite a personality. We are having huge fun, Loree, and anything, in our book, is better than washing and ironing!! The flowers from the Mad Italian Boys are lovely and they go on, and on, and on!! Now, Helen, that we suspect may be a leading question!! That is for us to know and you to find out!! We do hope all is well and miss your posts. All is - tempting fate - very well indeed. and would be delighted to see you there. So pleased to know that all is, as we say, well. We shall most certainly now seek you out in your new hiding place. Joy of joys. Perhaps the bear needs to sit menacingly at the end of our own street to frighten off Russian tanks when they appear around the corner; we trust not. Goodness what hectic lives you lead I feel tired just thinking about it! But it is obvious you enjoy being in the thick of things - no time to get bored that's for sure. Certainly, Elaine, we are never bored. And after twenty-five years spent in the depths of the Herefordshire countryside, Budapest is a complete change. Belated Happy Birthday and Anniversary! Great to hear you're both having a wonderful time there and the life you lead is something to aspire for :) Have heard nothing but praises for the city of Budapest, beautiful and cultured and very motivated to pay it a visit very soon! Thank you so much for the good wishes. We had a wonderful time since both birthdays and our Wedding Anniversary all come within a week. We are so pleased to hear such praise for Budapest. You should certainly pay a visit and let us know if and when you decide to come. We shall hope to keep you to that! How amazing, Bernice, that you were in Szentendre to which we often go on the HÉV, the overland light railway. It is certainly a pity that you were not able to spend more time in Budapest to which most certainly you should return. There is much to see and experience as well as many very attractive thermal baths. You have made Budapest my land of enchantment and propelled it to my next European destination. I will come seeking the Splendors of Budapest which by my reckoning starts with the Hattatts (3 't's just aren't enough). Come, and come NOW!! How we should love to show you around this most magical of cities and we suspect, rightly we are sure, that in your company we should all have the most amazing of times as well as, in all probability, getting up to a little bit of 'no good'!! Such fun it would/will be. Delighted at dropped formalities. I'd get on the next plane only I'm just walking out the door to a meeting that may change my life and precipitate my much hoped for Budapest debut. I am helping a buddy reopen a famous Chicago tavern so please tell me the HATTATT (even your name has such gorgeous architectural symmetry) cocktail of record we can nickname the H-Bomb in your honour! What fun to be on these informal terms, or as the French would have it 'Tu'!! We have the same in Hungarian but it is, as all things here, rather more complicated. We shall introduce you to the concept when, and now it can only be 'when', you step off the aeroplane. That must be great and fun....beautiful flowers ! !...happy week love Ria...x ! Enormous fun, Ria, and the flowers have given us endless pleasure. I made the mistake of giving my housekeeper the night off 36 years ago, and I haven't seen her since. Big mistake, Tom. That said, ours rules us with the proverbial rod of iron. And if truth is to be told, we are just that little bit scared of her! Thank you so much. We had an excellent time and were so kindly and generously treated by friends. The celebrations seemed to last for ever and The Mad Italian Boys' flowers are still giving us huge pleasure. As it happens, we are 'in' tonight and tomorrow!! Indeed beats washing day! Such wonderful occasions to commemorate so let me join the chorus in wishing you everything from happy birthday to happy afternoon naps to recharge the zealous frame. You two are perfect fire balls! Anything in our book would be better than dealing with a load of washing!! Not sure where we should start! But, seriously, we have been having the most wonderful of times and friends have been so very kind. Thank you for all your wishes. Would that you could be with us, together with your family, to share the joy. That would indeed be deeply lovely. Oh Lordy, I want a Timea in MY life! Hi Jane and Lance, forgive me but had to say it. Mercy, remembering Timea's fine food, your beautiful home...my prayer is, Please Lord, let me move to an area where people want to work and I can find help! Birthdays and anniversary...grand! When and who? Mine was Friday, the 11th and I was 61. No need to tell me your age; it's just I don't mind telling mine. I've earned each one and am happy for them all although I've promised myself to spend all the rest possible somewhere other than home. Right now I'm researching the Orient Express. love to you both with birthday wishes for all happiness as well as for your anniversary. We are, dear Sandra, so fortunate to have Tímea and count our blessings daily. She has now been with us for a staggering ten years and so is very much part of our lives. How we wish we could find you someone of your own to give you what we know to be much needed help. Many belated birthday wishes. Ours are 28th. March, 4th. April, and our Wedding Anniversary, 34 years, was 29th. March. And so the years go on. The Orient Express. Now that is something. How exciting!! All the best with your VIB tour, sounds overwhelming but I know it will all go well and everyone will have a wonderful time. What name did you give to Mr or Mrs or maybe Ms Teddy? Thank you so much for the good wishes. We are very fortunate in the lives which we lead and hope always never to lose sight of that. We are much looking forward to 'The Tour' although still need to spend time in preparation. But it should, as they say, be all right on the night!! We hope so. Mr.Teddy has been named Alexander after the friend who originally introduced us to The Princess. Happy Birthday! Gorgeous flowers, lovely pink heads! Sorry to hear about the lack lustre evening with Rufus Wainwright. On a cruise ship a few years ago, after having dinner, we made our way to the theatre, to be entertained, we arrived late because Carmen had eaten three puddings and the show had already begun, the audience mainly Americans were whooping and cheering and waving their hands like demented windmills, what was the cause of this latin esque hysteria? I hear you ask. It was a little old man alone on the stage plucking at a banjo! I turned to Carmen and said I can't watch this rubbish, she agreed and we both left. If we had read the ships entertainment flyer delivered daily to our cabin, we would have known that the little old man plucking the banjo was folk legend Pete Seeger. In some parts of Yorkshire if the front step is not scrubbed at least once a week with a donkey stone, then you're classed a fallen woman. Mitzi, darling, we thought that you would love the flowers [especially, perhaps, the pink ones!!]. You really know how to treat yourself, not to mention the dreaded Carmen, with tales of life on board. We have yet to succumb to 'The Cruise' for fear, and now our fears are confirmed, of spending each evening, bloated with too much pudding, listening to some old folk legend well past his, or indeed her, sell by date. We rather think that we should be considered 'fallen' regardless of the state of the front step by those all knowing, all seeing Yorkshireites.But, pray tell us, Mitzi, what is a donkey stone? I'm quite fond of the stuffed bird with the glass dome. Donkey Stones were/are a mixture of ground up stone, powdered bleach and cement used for cleaning brickwork, stone steps, removing stains from clothes and for cleaning yourself with once a week in a tin bath in front of the fire, a good all rounder. I hope Timea doesn't invite her friends in to try on 'madam's' clothes when you're out for the evening. It is a worry. Darling, thank you so much both for this explanation of 'Donkey Stone' and for the link which you have most cleverly inserted into this comment. Oh, the wonders of modern technology! Now your remark apropos Tímea and our clothes has seriously alarmed us. It is indeed a worry and one that is unlikely to go away. Of course, we could, when she is 'off'', try on her uniform - a bit like playing doctors and nurses!! This is so very kind of you, Launna, as always is the case. Just occasionally we should, we feel, rest up a little more - too much in the way of burning the candle at both ends. We were so pleased to know that you are feeling better in yourself having lost some weight and we are sure that you will succeed in not putting in back on. The way I look at it Timea is one lucky person to have you two under her charge, all the sophisticated excitement and energy must provide a bit of a contact high. I do declare! Meanwhile, continue to seize the days. It was a week of birthdays as well as our Wedding Anniversary although we think we are reaching the point when it is better not to continue to count. Thank you so much for the good wishes. Sometimes we feel Tímea is a little bemused at the comings and goings but she is extremely loyal!! Carpe diem - a must!! There are teddy bears, then there are TEDDY BEARS. Happy Birthday to you both and you certainly know how to celebrate in the biggest and best ways. We had planned on going to see The Grand Budapest Hotel on Saturday. I really wanted to like it but was not sure it was my taste as the previews showed quite a bit of slapstick. Instead we decided to go out to dinner under the stars with some good friends. I think we made the right choice. Alexander, for such has he now been named, is, as you say, some bear! He is currently presiding over the spare bedroom. Thank you so much for the birthday wishes. We had great fun. We were a little divided over 'A Grand Hotel Budapest'. Possibly much depends on whether or not you are a fan of Wes Andersen. However, dinner under the stars with good friends sounds to be a more than excellent alternative to a night in the cinema. I am so delighted to see you out and about and enjoying life to the fullest. Life is for living and discovering daily. I am truly happy for you and how thoughtful of your dear friends to shower you with gifts such as flowers and that wonderful Teddy Bear. But you too, dearest Helen, know how to live life to the full and how to take joy from the smallest to the greatest of happenings. What, we so often ask ourselves, is there not to like? Oh, I feel rather weary after hearing of so much socialising. The flowers look wonderful. As I am typing this, my partner has gone to see a film. Yes, you guessed it, A Grand Hotel Budapest. I will be interested to hear if he has a divided opinion. But you are about to spend an entire holiday socialising, Andrew!!! We shall be much interested to hear what R makes of 'A Grand Hotel Budapest' which, other than for the title, has nothing to do with this city and was, so we understand, entirely filmed in Germany. No, not planning to do much socialising. But it is unavoidable, Germany. Thanks. Saved me some research. R thought it was an ok movie, damned with faint praise as I interpreted it, The hotel was wonderful, and the hotel manager had some great lines, which I believe were delivered by a Mr Feines, who is now in Australia. Do not google Feines and air hostess. R's response to 'A Grand Hotel Budapest' is of interest. Yes, it did have many good points but, at least in part, these were on occasion overtaken by several weaknesses or even flaws. But this is only a viewpoint. Scrumptious flowers, and my love to both of you. I wish I could go on that tour. Wes Anderson needs to make a movie about The Hattatts! You are more than kind, Jen, and we do so appreciate all of your thoughts. Wes Andersen's films are very distinctive and always a little on the strange side. How wonderful if you were to be with us tomorrow night on The Tour. Now that would be fun. First of all a very Happy Birthday! With a schedule so full who cares about baking and washing :) This reminds me of my aunt who is a medical doctor, but loves to do dishes and vacuuming. My uncle (her husband) used to say "your housekeeper can do dishes and vacuuming, you are a doctor you should concentrate on your patients, because no one else can do what you do." So dear ones what you do is special keep doing it, let Timea take care of the house. Thank you so much for the good wishes. And how very understanding of you where the domestic chores are concerned. We do in life owe a huge debt to Tímea but argue that she cooks, cleans, washes and irons far, far better than we ever could. So be it!! But we are not entirely certain that our own activities would stand up well to a productivity test!! Belated Happy Birthday wishes from me, too! Are you going to keep the huge teddy bear? The size he is, he'll take up quite a lot of room no matter where you put him. You attended more performances in two weeks than I do in two years. As for Washing and Baking Days, if I wanted to have an entire day of washing, I'd have to wash each and every item in my wardrobe; usually, my washing machine deals with the washing of one week in 1 1/2 hours, and the rest, such as ironing, is done quickly enough as well. And baking... my Mum could easily spend a day baking, but not me. Thank you so much, Meike, It is most kind of you. We shall most certainly keep the teddy bear. To do otherwise would be hurtful to The Princess who is the most generous of people and with whom we have such fun. We are particularly interested in music and do so much enjoy the many concerts which we are fortunate enough to be able to attend. We do love all food but, sadly, have no wish, and little aptitude, to cook. Thank you so much, Gary. Too many years passing too quickly!! Thank you so much for these kind wishes. You are more than generous in all that you say here and it is truly appreciated. Yes, The Princess's gift of the teddy bear, now named Alexander, was simply one, albeit extraordinary, of many wonderful presents which she bestowed upon us. We have much for which to be grateful - and no washing to be done!! We are here, dear Alexander, and consider you very much a part of our lives, even when far from us!! I guess you two have never been inside a laundry and wouldn't know how to use a washing machine if you did! Now that's ONE entertainment you've missed! Do you ever stop? When do the lights go out? Are you up for breakfast at midday? Is Timea keeping plates warm ALL DAY in the hope you'll arise before dusk? Good luck to you. Budapest couldn't have two nicer residents! Actually, Faisal, you are largely correct in your assumptions although we were once in a launderette - such a fascinating experience - in the hope of seeing something approaching that old Levi jeans commercial. Sadly, we were disappointed!! Darling Faisal, this you may not believe, but we actually get up at 6.00am, rather like monks emerging from their cells, as it would be too shaming to be caught in bed with Tímea's arrival at 7.00am!! Congratulations on your Wedding Anniversary and not one, but two Happy Birthdays, dear Jane and Lance. You have been celebrating in great style, and what wonderful nights you have had. I would love to have been there in Budapest for the two choral performances; one of my great joys is singing weekly with a Ladies Choir, many of whom are retired opera singers. How I would love to be on your VIP tour at the Varfolk Gallery. 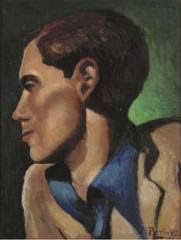 I see that Keseru lived and studied in Australia for some years, and is represented in Australian collections. The concept of Mus(e)ic as visual art is quite wonderful, and I do hope you can show us something of this exhibition. Great Post!! This is so very, very kind of you, Patricia. We have much enjoyed, as you may imagine, not only all the celebrations but also the subsequent outings. How really wonderful that you sing in a choir. You would, most certainly, have loved the Purcell Choir as well as that of Nemes László where the singing was unimaginably beautiful. Yes, indeed, Keserú, who we met yesterday for the first time, studied in Melbourne [diploma and MA from there] and lived in Australia which has had a great influence on his work. We are looking forward to 'The Tour', if not a little worried at the prospect! I would be very envious if I wasn't aware that envy is one of the deadly sins! However, I am glad you are having such a wonderful time and many, many Happy Returns. This is so very gracious and generous of you, Marianne. Thank you. Now, we most certainly must not keep you away from any of your afternoon's activities but, why not, just this once, pack up a picnic tea, take the dog for company, and go for a long walk to enjoy the wonderful spring sunshine. Do not return until dusk, and then kick the dirty washing into touch and declare a truce on the weeds. Hopefully you will be so gracious as to accept a virtual bouquet of Belated Birthday flowers! For I am sending my wishes for a wonderful year ahead, full of great health and even more splendid adventures such as those which so tantalizingly been shared with us here. How very sweet of you, Heather. And thank you. But we are constantly reminded of you with the wonderful lavender which you sent and which is still very much treasured. We do so hope that all continues to be well with you. Dear Jane and Lance – A belated Happy Birthday and congratulations on your Anniversary. Looks like your social life is fulfilling and I’m always amazed with your glamorous and energetic life. Generally our activities get slowed down as we get older, but you two look opposite to that. I know good music and art and delicious dinner with a good company recharge yourselves but frequent events would make you tired physically. Please take care. I like the refined taste of your rooms which I sometimes glimpse into. Yoko, this is so very kind. Thank you so much. We are indeed most fortunate to be able to enjoy all of the things that we do and, in particular, we love the fact that there is such a rich, musical cultural life here in Budapest. And when and if we tire, then we shall go to bed earlier and sleep later!! The flowers are beautiful as most flowers are! Seems you are both keeping busy, enjoying each moment and second of everyday. It is indeed wonderful to be entertained by such talented people, and no doubt finding it difficult at times which you prefer. Thank you so much for these birthday and Anniversary greetings. The flowers were, and continue to be, wonderful and have given us such joy. And there were others, not shown, so at one point we rather resembled a florist shop. Our friends have been so very kind and generous towards us. You managed to mention two important topics for me this week. 1. You saw a choir playing works by Mendelssohn and Schónberg; I am interested Schónberg as a great musician and an ok artist. 2. I have tickets for Hotel Budapest. What did you think of the filM? The Schónberg: Friede auf Erden [op.13] was magnificently sung, so much so that we felt wave after wave of music washing over us. Sublime. The mendelssohn consisted of two pieces: Sechs Lieder [op. 48] and Drei Psalmen [op. 78]. If you are a Wes Andersen fan, the you will very much enjoy 'A Grand Hotel Budapest' which undoubtedly is interesting in the way in which it is filmed, how it captures an era [in fact more than one], and is visually attractive and has some excellent character performances, notably that of Ralph Fiennes. But......!! Somehow our lives are something of a whirl, Yvette, but we should not, in all truth, wish them to be any other way. How kind of you to send us good wishes - they are much appreciated. The teddy, Alexander, is proving something of a handful and for the moment has been put in charge of overseeing the spare bedroom! Joyous birthdays and happiest of anniversaries! Art, theatre, concerts, dance, and... your VIP tour. So, the whirlwind will have a grand crescendo this week and how I wish that I could be there for your wonderful personal tour of Várfok. The paintings of Jovánovics Tamás, particularly the three-dimensional "sliced paintings, are fascinating with their seemingly mathematical approach. To only see the works of Keseru Károly on a computer screen certainly misses the fine detail and texture of the work. I did not know these artists but looked them up. You have a wealth of artists and talent who have either been born in Budapest or who have found their way to this city. Once the grand Jane and Lance VIP tour and party concludes, I do hope that you will sincerely consider putting your feet up and pampering yourselves a bit, with the help of Timea, bien sûr! Will be thinking of you both tomorrow with the best of wishes for the event. Thank you so much, Genie. We have had a wonderful week or so and now, looking at the diary, there are a number of interesting and exciting events still to come. You clearly have a real appreciation and understanding of both of the artists who will feature on 'The Tour' [how we wish you could be with us or, even better, leading it!] and, as you rightly say, Keserú's work, in particular, does need to be seen close up to recognize the amazing detail. We met him for the first time yesterday afternoon when it proved so interesting to hear him talk about his work. He is, of course, utterly charming and quite self-effacing. Great Day in the Morning, Chillun!! Do you EVER sleep? What a schedule, and what grand and glorious moments and colours and sounds and people and melodies must be swirling in your dreams. You young folks DO BEAT ALL. I’m going to have to read it all again to absorb bits and pieces at a time---just the ticket stubs and programmes would cover a bulletin board the size of Times Square’s. It’s lovely to see such happy chaos as must be your social calendar, and such enrichment and enjoyment in every hour. And you have time to visit your friends on this world-sized bulletin board where we met, to read and send kind words and such sweet personal notes---you certainly are a bright note in my own days and small doings. (Locating the Wedgwood egg cups for these dozen-and-a-half eggs we dyed with Sweetpea---she took that many home with her, as well---and deciding between steamed asparagus with Hollandaise vs. roasted with grape tomatoes and balsamic are my own modest activities, along with righting the house for guests the week after Easter). Our world here is settled and small and quiet, and the bright dash and shine of your own are a joy to see. Just knowing someone’s out there celebrating SOMETHING all the time, with friends and artists and musicians, moving in a milieu of such genius as you seem to attract, is a wonderful thing, and your being so kind as to invite me along is a lagniappe I’d never expected. Actually, Rachel, we really do sleep, and sleep well. Most likely on account of total, physical exhaustion which, happily, neither of us recognizes as such. Far too tired to dream!! You are, as always, so very generous in what you say. We have taken to keeping programmes with the idea that, one day, we might piece them altogether in some massive scrapbook. But even in writing this, we recognize a certain fallacy. How wonderful that you too dye eggs. That is such a Hungarian tradition, to be eaten with home cooked ham and horseradish [the British reserve that to accompany beef] at Easter. But your mention of asparagus with Hollandaise and you are touching on something very dear to our hearts. Indeed, asparagus must be purchased as soon as the market opens tomorrow. Glorious. Your world is, we know, full of joy and creativity and kindness to others. For what more can one ask? And, if at the end of it all we are to be judged, then it will, we believe, be on love and love alone. You will pass with flying colours - and that is a certainty. PS You Lovies are SO dear. And I DO have a genius thing to report!! A friend---a Mississippi Girl herself, just won the PULITZER for fiction.! Now that is WONDERFUL news. You are full of happenings!!! Dear Jane and Lance, firstly, happy, happy birthdays! I hope that this coming birthday year brings you lots of new travels, adventures, good health, laughter and of course love. Secondly, i am so disappointed that Rufus Wainwright didn't deliver. I am a big fan of his and I hope that he will get his act together and be back on form soon. Now, i am a little bit envious of all the partying and cultural events you have been enjoying. What a wonderful way to spend your evenings. I have recently seen a wonderful contemporary dance performance by a Belgium company called Les Ballets C de la B. For a strange reason they are not as well known in the UK as they are in Europe, so if they happen to come to Budapest, I strongly recommend it. Their take on difficult political issues is always sad as well as comic and the corepography and the dancing superb! This is so very kind of you, Red. As it happens we have much to look forward to over the next few months but then we rather think that every day has the potential to be an adventure. It is true both we, and the friends with whom we went, one very enthusiastic about Rufus Wainwright, were all disappointed and felt that each song sounded rather as the one before and were all rather on the dull side. Perhaps he was really tired as he was on tour in Eastern Europe and only appearing in Budapest for the one performance. Les Ballets C de la B sound to be exactly our kind of company. Whilst we love classical ballet we are also most appreciative of contemporary dance. We shall definitely keep an eye out for them. Do you know the Balletboyz, founded by the son of a friend of ours? They are well worth watching and now also include young women as well as men. Have a very peaceful, restful and joyous Eastertide. Yes, i do know the Balletboyz and have seen a few of their performances in the past, as well as the documentary they have made in Cuba. They are a great company and I am pleased that they now have women dancing too. Over the years I have come to love contemporary dance more than ballet, i am afraid. Pina Bausch's dance company has me rushing to the theatre whenever they are in London. I am lucky to be living here as there is always something new and exciting to see. And as I can see you are also sampling the best that Budapest has to offer. Life is not worth living without art and cultural happenings. We have not unfortunately seen any documentary about the Balletboyz but would imagine it to be most interesting. Pina Bausch's dance company we must certainly look up - it sounds exciting. There is much modern dance here in Budapest which we try to see whenever we can. Knowing many of the dancers adds to the enjoyment. Have a joyous and peaceful Easter. Reading your blog makes me realize what a life of relative solitude I lead! I have spent the week reading a biography of Lorenzo the Magnificent, and drawing. I find, as perhaps you do, that smaller dinner parties make for more in-depth sharing. We cannot really believe, with such a major project in progress. Mark, that you have time for much else at the moment. Yes, we rather like smaller numbers for dinner as you do, and are seldom more than ten or twelve, as it makes for much more worthwhile conversation. I just answered your comment on my blog - regarding cabbage pizza! I got carried away and thought I was e-mailing - so the answers to figs and cabbage is there if you can take time to go back and look at the comments on my post (and there aren't hundreds to check such as on yours!!). Meanwhile dear ones, loved this post and hearing all about your recent gallivanting in the beautiful city. Seeing your friends sitting in M made me smile - I love it when photos pop up of places where I've sat myself, and that meal there last October was so good even for me, a vegetarian. Please say hello to Miklos for me when you next go back, and tell him we'll be back next year……with you hopefully! Belated happy birthdays and anniversary - wishing you many happy returns of both - loved the glorious flowers. I'll be replying to your e-mail later, promise, I'm gardening like a fiend right now, everything is growing, blooming, sprouting, as we've got gentle, English-style rain today, and yes, we even worked out there in it which was such fun. Take care - continue to enjoy every day, that's what we do and we're much older then you Spring chickens, LOL. Of course we have seen your answer, Mary, and will return again with a small 'follow up'!! It is all such fun. We are in the 'M' restaurant quite often and will, most certainly, pass on your 'hello' to Miklos who remembers you well. Whilst we do eat meat, we quite often choose the vegetarian option ourselves. The food is, we think, good and it is such a friendly, atmospheric place which represents still, in this day and age, excellent value for money. We look forward to our all being there together. Thank you for the good wishes. Too many years are now going past too quickly!! So good that you are able to be out in your garden. We always thought that work carried out now pays off later on. The flowers are indeed lovely and have lasted really well. They have given us such joy. Well goodness gracious you two are social butterflies. Life to the full. We do, we assure you, have moments of rest, Olive, without which we should completely exhaust ourselves!! My goodness me what busy but exciting lives you lead. I'm quite exhausted just thinking about it. How lovely though. My motto is live for the day - seize the moment and enjoy which you too certainly are. Many happy birthday wishes to you and I simply love the flowers. Better this, we think, than do nothing and, possibly, achieving very little in our days. We certainly do believe in Carpe diem, as you do too. Such an important message always to keep in mind. All the very best for the exhibition tonight! Is The Grand Hotel Budapest not as good as the hype? I was thinking of going out to see it next week. Should I wait for the DVD? Thank you so much. Nervously making final preparations right now but placing our trust in the maxim that 'it will be all right on the night'. Think you would not miss out on too much, except being topical, if you were to wait for the DVD of 'Grand Hotel'. In retrospect, we should possibly have waited. But a cinema ticket here is still not expensive and so little to lose. Happy birthday and a very Happy Anniversary. Keep being amazing! I think I have said this before and don't mind repeating - what interesting lives you live! And thanks so much for letting us live the same, though vicariously, through your wonderful blog. I have been waiting to catch 'The Grand Budapest Hotel' but it's yet to hit the theatres here (that are, quite annoyingly, too much sci-fi obsessed!). I cannot afford missing something that has Ralph Fiennes in it, you see! Hope you had a grand gallery tour. Thank you so much for these wishes, Suman. It is more than kind of you and very much appreciated. We are conscious how blessed and privileged we are with our lives, not least because we encounter so many really interesting people from all walks of life, so many of whom we can truly call friends. But it is, as you will know yourself, so important to be open to whatever life offers. Ralph Fiennes is an actor who we greatly admire and is, in our opinion, always worth watching. Soon we are off to the Gallery. WE hope very much it will prove to be fun!! I think you do deserve a few days in to rejoice and meditate on the plentiful outs of your extenuating wonderful life! Totally hectic but, that said, enormous fun although at times a tiny bit tiring. But we should not wish to do anything differently. We are now looking forward to a relatively quiet time over Easter - some days to recharge the batteries! It's a wonderful life! ...as the James Stewart film states. My word you two have a busy and fun time. Congratulations on your wedding anniversary and belated birthday wishes. I love Rufus Wainwrights voice, so it's sad to hear he was not great, but he's a difficult guy I feel, so that will reflect in his performance, even though it shouldn't. Now I'm off to ask hubby why we don't have a house keeper!!!!! And what a wonderful film that is - a sure fire 'classic' if ever there was one! And thank you so much for the birthday and anniversary wishes. Perhaps we were just a little unlucky with Rufus Wainwright, the choice of songs and the presentation, for we do most certainly acknowledge that he has a very attractive and powerful voice and can sing. It is a real pleasure, Julia, and the flowers have lasted and lasted and are still giving us great enjoyment. Thank you so much. But we have now reached the point when they should be allowed to slip by unnoticed! Happy birthday to you both! I wonder if you will bless us with some images of the exhibition pieces? I do hope so! Thank you, Matthew. Returned from the exhibition which was enormous fun and we had such an enthusiastic group making it all very worthwhile. Certainly a possible future post!! Have a wonderful Eostre weekend. Such a pity that you could not be with us, Di, for we suspect that you know how to paint the town red. Take care. Thank you for your comment on my blog! Yes, Connie is quite delightful - one of my favorites. Your blog is impressive, as are your travels! I shall have to spend more time looking carefully at your photos and posts when I'm not rushing off to work. How nice to have found you! We were so delighted to have found you too but are, at present, experiencing problems following you. However, as mentioned, we shall keep trying!! We wish you a very happy and peaceful Eastertide. Thinking of you today, with your feet up and laurel pillows poufed, resting and discussing the whirlwind and the delightful evening of art and wintertaining. (Yes, that's a typo, but I'm letting it stand---wouldn't take Freud to decipher that one)..
Just wanted to thank you from my heart for the lovely review of Miss Mavis---she's a composite (one of whom was in position to do damage to folks who DIDN'T answer her piercing questions, hence the portrayal in less than my usual rosy light). I never fail to be so surprised at your interest and the time that you take to respond---it's a lovely lagniappe in my life, and I hope you have and enjoy much more of that in your own. And if I could covet, could envy any of your lovely activities and adventures---that would be a Timea of our own. I could introduce her to the charms of collards, cornbread, a shrimp boil in the back yard, and a REAL pit barbecue. Amber waves of grain included. Must get off this silly streak and go get the Easter ham and asparagus. Sweetpea and I are making a strawberry cake tomorrow. With Peeps. THAT should be an adventure in itself. We were utterly captivated by your portrayal of Miss Mavis, as we are by all that you write. Indeed, just today we read the comment which you left on ASD [you see, we have spies everywhere] and were so utterly struck by "moustached lip was as forbidding as a frown". What words, what expression!! Tímea is, as you may imagine, an invaluable part of our lives. However, we shall not allow her to see your comment lest she be lured away by the charms of collards, cornbread and a shrimp boil!! Now, a strawberry cake. May we jet over to join you? Have huge fun, and take care. Oh my goodness your week of such cultural pursuits made us sound like backpackers as we ramble about Crete. (Monday was wash day in our hotel room because the sun was out and we were racing to beat the rain clouds that arrived today. Wash is nicely put away in the suitcases, so I can indulge in reading of other's adventures. . .and you are among my favorite adventurers! Looking outside on a very grey and chilly day, Jackie and Joel, we rather envy your touring through the Crete countryside in your teeny, tiny motor car. But good to hear that you achieved your was, always a problem when one is on the move, and are now set up for further adventures - we shall be with you in spirit! A happy and peaceful Eastertide. Thank you, Stephanie. And that is exactly what we intend to do this weekend! But perhaps the work simply goes unreported, Annie!! Woweee! Dear Hattats, I will begin by sending the warmest of Birthday and Anniversary wishes!!! Gratulálunk! And I hope all went well with the tour...how exciting! two weeks! :) Wonderful photos too! (Did Lance find the perfect spot for that bear?) ;)) And a noble bear at that! I am sorry about the R.W. disappointment, but it sounds like the rest more than made up for it. A huge thank you for your visit, how thrilled I was to see your message! You are blessed with Timea....and yes, beet root is a favorite in that corner of the world. Sending springtime hugs, and wishes for a beautiful Easter to you too! Thank you so much for your good wishes, Irina, which are warmly received. And the tour, as it happens, thank you, went exceptionally well. We had a large, interested, appreciative group who turned out to be an excellent audience. And there was wine to be had, and much fun too. You are so very kind with all that you say here. Like you, we really believe that one must, wherever possible, seek out the joy to be had in life, often to be found in quite simple pleasures, and to try to live every day to the full. For the moment the bear, now named Alexander, is presiding over the spare bedroom. We are also so pleased that you noticed and liked the handbag. It was a birthday gift from a friend a year or so back. WE are indeed blessed with Tímea. This weekend she is off for Easter and so we are having to fend for ourselves. Happily she has prepared and left much in readiness for our meals and we also have several invitations to be out. Thank you so much, dear ones...love to you too! Belated birthday greetings. One thing is for sure, Jane and Lance, and that it if you keep up this rate of activity you will definitely wear out, not rust. ;-) Your hectic social whirl sound such fun and very satisfying. Thank you so much, Perpetua. There are, although we do try to fight off the feeling, occasions when we do feel very worn out but, as you say, better that than to rust away!! Our warmest wishes to you this Eastertide. May your days be filled with peace and joy. What a great week of culture and other delights! It makes my week look very mundane! Sorry to hear that Rufus Wainwright wasn't so great. We have, indeed, been very busy. But, as we all know, the Devil makes work for idle hands!! Yes, Rufus Wainwright was a little disappointing but then this can happen sometimes. Sounds like you celebrated your birthday in style! If I can't live your life...at least I can read about it...Oh to have someone to cook! Wouldn't that be grand. I was hoping to see the Budapest Hotel movie. Shall I not bother? We tend these days to not count and not bother too much with celebrating birthdays. Too many of them have passed! So, this just happens to be a selection of events which have filled our social diary in recent weeks. Having a housekeeper who cooks is definitely one of life's greatest luxuries. We have always wanted this and now are lucky to have achieved it. Timea is a treasure. We were of very different minds about the Grand Hotel Budapest, one of us thought tedious, the other interesting....so who knows?!!! Green with envy at your morning room display. What a shame about Rufus Wainright though. I would have loved the Mendelssohn, but not, I’m afraid, the Schónberg, that seems an unusual pairing, or am I missing something? Yes, Rufus Wainwright was a great disappointment. Our friend who has heard him before thought this was a very poor performance so obviously not typical of him. The choice of songs was rather monotonous, sad and dreary. Not a happy experience. Well, the Schónberg was truly magnificent. We would usually agree that his music takes some listening to...if one can. But this performance was outstanding with the music coming over to the audience as rivers of sound. We cried!! To be absolutely truthful, Loi, we were rather hoping that you might adopt us. We have rather set our eyes and heart on living in that wonderful grey and lemon painted new house of yours in Maine. So, do we have a deal?? A joyful and peaceful Easter to you. Let me add my best birthday and anniversary wishes to everyone else’s. That first bouquet of flowers is astonishingly lovely. My love of flowers and gardens is only second to my total disinterest in gardening, so I get lots of vicarious pleasure in pictures of them! A whirlwind two weeks, indeed – the two of you are both awe inspiring and exhausting! In thrall and breathless, as always! Thank you so much for your good wishes. It is so very kind and thoughtful of you and much appreciated. We love what you say here about gardening and, having given up doing it after twenty-five or more years, we are rather of the same mind. Let us have the flowers delivered to the door from now onwards!!! On this Easter Saturday, we wish you peace and joy this Eastertide. Happy Celebrations. What a Whirlwind! I saw The Grand Budapest Hotel and I must say that I just loved it. Of course you would have a very different perspective. Can't wait to see what you two are up to next! Life is indeed such fun if not a little hectic at times. We are so pleased that you enjoyed 'A Grand Hotel Budapest' and certainly we believe Wes Andersen to be a most interesting director. Have a very joyful and peaceful Eastertide. Hope you are having a good Easter holiday. My belated best wishes for your birthday and anniversary. Many happy returns. Your celebrations seemed to be packed with a succession of events where the art of dining, entertainment, cinema, friendship, visiting the galleries and the Private View were the order of the day. When I read this entry, I said to myself, my dear friends Jane and Lance should be the Culture Secretaries of the World. I am not certain how soon your beloved housekeeper Timea would be retiring from her position. If there is any opening in the future, I declare that I would not mind becoming a butler in your most cultured house!! But I dare say that your dance card will be full. I must admit that my skill in efficient organisation, planning and preparation might not be as meticulous and reliable as your Timea. Have a wonderful weekend, dearest friends....I am currently away on holiday - a little break from my normal stamping ground so to speak. So, please bear with me. I'll be back soon. How wonderful to hear from you. We have missed your posts but can now see that all is well with you and that you are enjoying yourself on holiday. Perfect! Thank you so much for your kind wishes. Our birthdays are now too numerous to wish to count and so we just celebrate willy nilly as the mood and opportunity takes. We are flattered by your suggestion of the posts of Culture Secretaries of the World but can only imagine what a headache that would be. However, we do believe that if culture rather than politics could rule the globe then surely the world would be a happier and more enlightened place to be.Sometimes one does think that the C in culture has been replaced with a V and kindness has all but disappeared. But, then, you darling ASD pop into our comment box and, suddenly, the sun is shining once more. Oh if only we could tempt you to this foreign land for even the briefest of visits. We should not hear of your butlering....definitely not....we should all while away the days in reading, writing, listening to music and gallivanting about the various cultural establishments that this magical city can offer like no other. What a time we shall have....SHALL have, please note!!! Looks like a wonderful time was had by all and the flowers are beautiful. But perhaps I could cut back if I had such glorious surroundings as you do to enjoy. We do so agree that washing hung out to dry resonates with the great out doors which it never has from an airer inside. We had a friend whose washing line ran the length of a long border of lavender. Perfect, or so we always thought. As it happens winter is a season we much enjoy, particularly those really cold, crisp days. How absolutely FUN! Jane, you and Lance sure enjoy yourselves in ways I would dream of! Theatre, concerts, restaurants with friends...delightful! And I thank you so much for coming to visit with me. I hope your Easter weekend was lovely. Ours was finally warm with signs of spring. We are late here in the upper midwest, but it's typical because we are in one of the coldest areas of the USA! We were, Anita, truly delighted to see your post and we are so very pleased that you have, at the very least, enjoyed some warmer weather this Easter time. You must, we imagine, be really pining for spring. We are so blessed in so many ways but, most importantly, to be surrounded by so much kindness from so many very dear friends. Take care and have a good and happy week. You are surrounding yourselves with beauty in music, dance, food and friends and supporting artists of all kinds in their endeavors. Well done! Thank you. It is of course the friends who count for most but we are doubly fortunate as so many of them are really talented and work very hard and are completely committed to their speciality. I wanted to stop by and thank you for your very generous comment on my blog today - so kind of you. You are so busy! But by the sound of it having a wonderful time. Belated birthday wishes to you. Life does from time to time seem exceedingly hectic but that is probably all to the good. Or so we think! Thank you so much for the birthday wishes. Best wishes from me too! This is called dolce vita the way you live and It's so beautiful when people can do things they love and give them pleasure. Wish you always be able to enjoy life at its best! Thank you so much, Olympia. We are very, very privileged to be able to lead the lives we live. However, it is the real friendship and kindness which we receive from so many which is what counts above all else and which matters more than can possibly be said. Jane and Lance I love that you do everything properly! All of these activities are so stimulating and lovely for the mind and soul. I have to say I think the giant teddy bear is fabulous. The teddy has been named Alexander after our friend who was with us at the time. Just checked back after going out to a nice Spring-on-the-patio lunch with Chris---what a lovely surprise to see you two busy people peeking in and being so very kind and complimentary about my simple little memories of things of such meager import. I’m continuously surprised that you’ve been here, that you somehow pop in and leave such sweet, insightful messages, and it’s such a lovely moment to see your names on the board. You know I’m all words, all the time, but I find no proper ones sometimes, to express the mixture of puzzlement and delight that you take such time and effort to come by and read, and then to send such considered, to-the-point comments. Some days I just have this vision of you two at the breakfast table, Timea leaning past your shoulder with a fragrant stream of coffee for the cup, laptop discreetly nestled up against the toast rack, both of you with glasses elegantly low upon your noses, surfing around to your colleagues, friends and fans and reading out bits to each other like a breakfasting couple of the genteel, simpler past sharing the morning post, wrapped in homey warmth and comfortable familiarity as you start the day. OH. My. That sentence was a bit of Bulwer-Lytton’s tea-cozy, wasn’t it? But I’m honoured to be able to contribute a wee word to that tableau occasionally, if it could add any more joie to the vivre. I’m simply surprised and fascinated that such plain, plain-spoken and unfamiliar people and their little quirks and doings as these American South folks are of interest to you. The rustic, small-town ones I speak of so often seem as far from your milieu as Mars. And then again, with your many engagements and calls upon your company, I think sometimes that you must have a bevy of assistants at your command, to cover the wide circle of your admirers’ and friends’ own blogs and e-mails, pouring out a synopsis, then clicking and whirring to post speedy, appropriate responses to all the wordfare on your virtual doorstep, much as several of my own followers have avowed that I seem as if I would have little birds to dress me in the morning. . . This is another of the “print it or not as you see fit,” for I just wanted to express how I appreciate you both, and how the wonderment of having what sometimes seems two Wonderland beings recognize me as a kindred spirit is so remarkable. You’re just not REAL somehow, sometimes---too much of a different plane of being. I have a rich, lovely life of people and books and music and activities and too much imagination for my own good. Theatre and opera and the symphony and all sorts of wonderful things are at my doorstep, and I’m drinking them up like the parched partaker that I was in my faraway life. But yours---they cross your doorstep and sit right down in the parlor, popping to the fridge for a snack---I just love eavesdropping and looking in and hearing about all those flighty and profound and fabulous moments which make you two the incomparable, not-of-my-world YOU. And that you include me---that’s practically alchemy. Rachel, please see our reply to this comment which, for reasons completely unknown, has chosen to appear at the bottom of the page!! And now having returned from shopping at the market with Timea, I have read, over the breakfast table, your delightful comment and the reply which was written by LH in my absence. I am touched by the beauty and love that shines through both of your words. How perfectly you both capture the mood of the moment. A life entirely enviable. How wonderful it is to have such riches for the asking. Although our lives here are not exactly short on culture (a year’s worth of tickets have already been bought) the variety and diversity of your entertainments leaves me wishing for the big city lights. One thing though: there is never any photography allowed at any event worth attending while the artists are on stage. My camera only comes out before the beginning and when we are rising from our seats just before leaving. All other photos are official material. Is this not so in Hungary? We do consider ourselves most fortunate with the richness and variety of cultural activities which surround us here in Budapest. At times there is almost too much from which to choose, all of it very affordable compared with comparable events in the United Kingdom. Yes, it is made very clear, along with much else, that photography is forbidden during any performance and so, like you, we have the same difficulty. Your 'Joie de Vivre' comes through in everything you do, I love the way you are truly appreciative of the remarkable life you lead. However even if the housekeeper was to have a day off I know that you'd even make Washing Day interesting! It is always a joy to pop by and read about your latest adventures. Thank you so much. Life, or so we believe, is for the living and we are so fortunate with ours. But, and this we believe you know as well, so much pleasure may be had from quite simple things which cost little or no money. And these are often the best! We are totally at a loss for words. Your kindness, thoughtfulness and care, not to mention time, in writing in such a way, Rachel, has touched us deeply. Please know how very much it is appreciated. Through contacts made within the 'Blogosphere' we have gained in so many experiences outside of our own, learnt so much about different cultures and ways of life in so many countries across the globe, and feel, as a result, our lives to be hugely enriched. Where 'Lawn Tea' is concerned, we can genuinely say that we delight in the insights which you give us, through the power of your words, not only into your own life but also into the lives, real or imaginary, of those characters, for they are such, who inhabit the Southern States. But, perhaps most importantly, we admire you as a person and a writer and what you have to say never fails to interest. Whilst at times a 'bevy' of assistants could be put to good use, it must always be remembered that there are the two of us to share in the writing of posts, replying to comments and to respond to what others post. We never regard it as a chore, and if it were to become so, then we should simply stop. On occasion real life does overtake, and when this happens we go off air until we have once more the time to be back. Happily the computer does not sit on the breakfast table, but that certainly is a time to catch up and discuss all that is going on where 'The Blog' is concerned. Through Tímea we are relieved of all domestic chores for she is with us full time, as she has been for the past ten years. We consider ourselves to be hugely privileged. Privileged to divide our time between this wonderful adopted country of ours, Hungary, and the United Kingdom. Privileged to have the means to travel, modestly we should like to think, and to enjoy so many cultural activities which so much add to our lives. But, finally, it is to the many friends, both young and old, that we look. For it is through them that we know true affection and love. It is they who give life its value. And it is not simply those who are in the here and now, but of no less worth are those who we have 'met' in the virtual world. And you, dearest Rachel, number so highly amongst them. The happiest of anniversaries to you both, and heartfelt birthday wishes. I trust your gallery tour went well..
.....a teeny post script: Do you suppose Alexander could feature in one of Mr. Orr's creations?